Tempest is pictured going WB/Bow, Judge Mr Lamar Mathis. Tempest first 3 pt. major WB/BOW Breeder Judge Mr Nestor J.Anselmi. Tempest's second 3 pt. 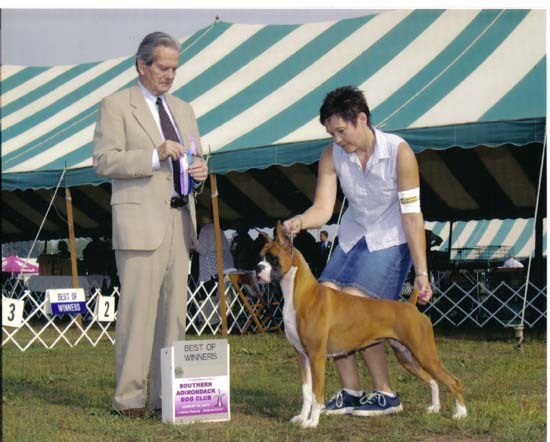 major WB/BOW 10/14/2005, Maryland Boxer Club Speciality, Judge: Mr Henry L.Gregory. On 11/17/2005, Tempest finished her championship going WB at the Central NY KC show, Judge: Mr Robert Stein.